P.S. I don’t mind swearing. I don’t even notice it. Loved the first lesson! Great idea! A little lengthier than I prefer for a podcast, but that could just be me – a person with a real 9 to 5 job and then also trying to write as a career during evenings and weekends. Great content. Great chemistry. Can’t wait for future episodes! Adding this to my list of podcasts to listen to on my drives to work. Good job you two 😀 Looking forward to the next one. I’m so excited for this podcast! You provide a unique perspective from two very different seasons of your career, and that’s something I haven’t really seen in other podcasts. I’ve been a big fan since 2006, and your blog, courses, and books (I don’t own all of them yet, but I’m slowly collecting them as funds allow) are my inspiration to write and get published (preferably with enough income to give Dear Hubby the freedom to start his own business). This podcast was absolutely fantastic! So many writing podcasts are so UNinspiring to me because they talk too much about “you must do X to make your story better” OR “readers aren’t enjoying your story because of Y, you must do Z instead”. I was super excited — practically jumping up and down on the bus — to hear Rebecca and Holly’s voices nurturing the part of me that wants to write and offering suggestions on keeping the inner critic in his proper place. 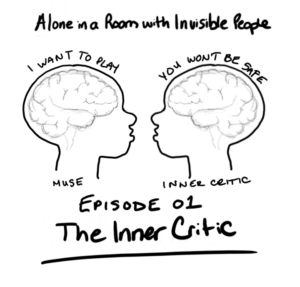 QUESTION: What do you do when you find the inner critic is ruining your enjoyment not just of writing but reading too? Since I started getting serious about writing, I’ve found it more difficult to enjoy reading because there’s always a voice in my head telling me I could never write such good prose, or come up with such an interesting character, etc. Any tips on that? I have found it helps to read out of the genres I write in (less likely to draw comparisons), or to read page-turning thrillers (no time for inner critic to get involved). But I can’t do that forever. Thanks so much for answering my question — and taking a whole mini-episode to do it! That was amazing! Very honest discussion and helpful advice. I’m definitely going to save that podcast on my phone and listen to it whenever I need a boost!